Everything you need to know - just click on the questions below. If you've got a question just call us on +44 (0)20 7249 5788, email us at id2@noisefusion.com or hit the contact page. How many cuts make up ID_2 TOTAL? What does the track listing look like? Is the new package as large as ID_1? What have you done to the demos to get that sound? What about licensing for groups or networks? We're quite a small station - can we afford ID_2 TOTAL? Can we licence ID_2 TOTAL on a market exclusive basis? How does the purchase itself work? What's the difference between the different ID_2 packages? Once I've bought the package, how soon do I actually get it? ID_2 TOTAL is 770 cuts resulting in over 2.9 GB of high resolution 24 bit audio. You get 535 brand new FX cuts across multiple categories and 235 cuts of beats, grooves, music, soundscapes and elements, many of which also incorporate yet more FX. 235 complex, fully produced FX cuts. The blazing hot core of ID_2 is a diverse and comprehensive collection of hyped and intense FX. There's some calmer stuff in there too. Well, just a little. For your sanity - and ours - every cut is uniquely named. 40 groove loops and beats. Upfront beats and loops across a range of genres and BPMs. All BPM identified. All tight as hell. 70 impacts and transitions. A brand new collection of our trademark, precision engineered hits, slams and impacts. These cut like nothing else. 62 cuts of soundscapes and sustains. Textured, multi-purpose soundscapes, epic drones and powerful sustains. Rhythmic and non-rhythmic. The sustains almost defy categorisation and are designed for when you want to "freeze time" or slow things down. Many of the sustains and soundscapes have yet more new FX built on the front - FX cuts you don't find elsewhere in the package and not counted in the totals. 153 music tracks, mixouts and elements. This category is based around 30 core music themes and all in totals a staggering 153 cuts. All comprehensively labelled, BPM identified and categorised into subdirectories. It's a package within a package. Full length pumped music tracks across multiple CHR and urban genres each with a whole array of mixouts and cutdowns including promo cuts, ident shells, underscore/alternate mixes, soundscape mixes, more brand new FX and impacts and drum-only mixes. An insane quantity. All obscenely high quality. And there's more. ID_2 TOTAL also now includes ID_2 Essential Extra and ID_2 Speed Shots, which add another 210 cutting edge, multi-FX cuts. Most FX cuts are "multi FX" and comprise many elements so the actual cut figure (by the way others often count it) is in orders of magnitude higher than we state. Our philosophy is that every cut should be a full production piece in itself so each one is extensively produced and most consist of what many packages would call three or four cuts. So, labelled another way, there's perhaps around 1000 individual cuts just in the FX category alone. Our FX cuts that are designed so that they can just be used as is but can also easily be broken apart as required. What you hear in the demos isn't dozens of tiny micro FX pasted together; the cuts actually sound just like this out of the box. So you're not going to have to work hard to make ID_2, well, work. It'll make your imaging sound awesome even when used as a plug and play package. Things start sounding spectacular, fast. Outside of the FX category, a large bulk of the other cuts also have more brand new FX built onto the front and/or within them. So the FX just keep on coming and we don't count any of these in the FX totals above. It's bigger. A lot bigger. If we compare like-for-like with ID_1 (ie as 16 bit audio), ID_2 is more than six times the size of its predecessor. And it has more than three times the number of cuts of ID_1. All in, ID_2 is the biggest package we've ever produced. In fact, by some margin, it's bigger than all our other packages put together. Nothing. Nothing whatsoever. What you're hearing on the demos is ID_2 straight "out of the box" - the only addition is our VOs/other VOs. Neither the video or audio demo had any processing added to the master buss nor were they mastered. All we did is brickwall limit the demos to prevent overs. So you're hearing ID_2 exactly as it sounds and it's how your productions will sound when you use the package. As well as wanting to do new and cool things creatively, sonically we wanted ID_2 to match and exceed the production sound of today's music. We wondered "what if your imaging could sound even bigger and better than the music you play"? So that big sound and sheen you're hearing? That's just how ID_2 sounds. No tricks. And when you start to stack up ID_2 cuts, this sheen gets even more brilliant - adding this fantastic quality to your sound. It means that with ID_2 you're not just getting the sounds themselves but as you use it you're adding a rich sonic texture that will add an incredible sonic signature to your production. We believe the high end sound of ID_2 is unparalleled in the industry. We chose to ship the package in 24 bit WAV so you experience the quality in full, down to the last drop of an impact. ID_2 TOTAL is licensed on a per station basis. Pricing is progressive and determined by your station's territory and Total Service Area (TSA) or size of market, meaning that stations large and small all get a fair deal and can all get hold of ID_2 TOTAL. For a quote for your station give us a call on +44 (0)20 7249 5788, email us with your details, or use our contact page to message us, and we'll get right back to you. ID_2 TOTAL is so large and diverse that it's designed very much with big networks and groups in mind. We're happy to discuss options and special deals for groups or networks, and even production companies or services. Just get in touch with us and we'll get straight back to you. We want ID_2 TOTAL to be available to stations and markets of all shapes and sizes. So if you're a small station we can discuss options with you. Email us or go to our contact page to get a quote. Yes. We're offering market exclusive licences for ID_2 TOTAL throughout the world. You'll have to get in fast though - once another station in your market buys a regular licence, exclusivity won't be possible for a year or two. Contact us to secure market exclusivity for your station. To purchase our ID_2 TOTAL library, just get in touch with us to discuss a deal for your station. For our ID_2 Essentials Series and Speed Shots packages you can pay online by credit card or debit card in the usual way, secured by PayPal. You can also pay with a PayPal account but you don't need an account or membership to purchase. You'll also be able to pay by electronic bank transfer or cheque if you get in touch with us. Our online store processes purchases in US Dollars. To quickly convert a price to your currency, use a site such as xe.com. When making a purchase, PayPal will automatically convert and quote in your currency at today's rates at no cost to you. What's the difference between the different ID_2 packages?" First we created the massive core ID_2 package. As time's gone on we've tried to make the cuts available to all sizes of radio stations and also for individual freelance producers. We've also added more cuts and packages. So we now call the core package ID_2 TOTAL. It's every ID_2 cut we've ever created (770 cuts and counting) and it's available to licence on a market-exclusive basis. It includes a library of beds - these aren't available in the other ID_2 packages. It also includes many more impacts and grooves and beats cuts not available elsewhere. We've launched the buyout ID_2 Essentials Series and ID_2 Speedshots to give you instant and affordable access to our next generation ID_2 sounds. 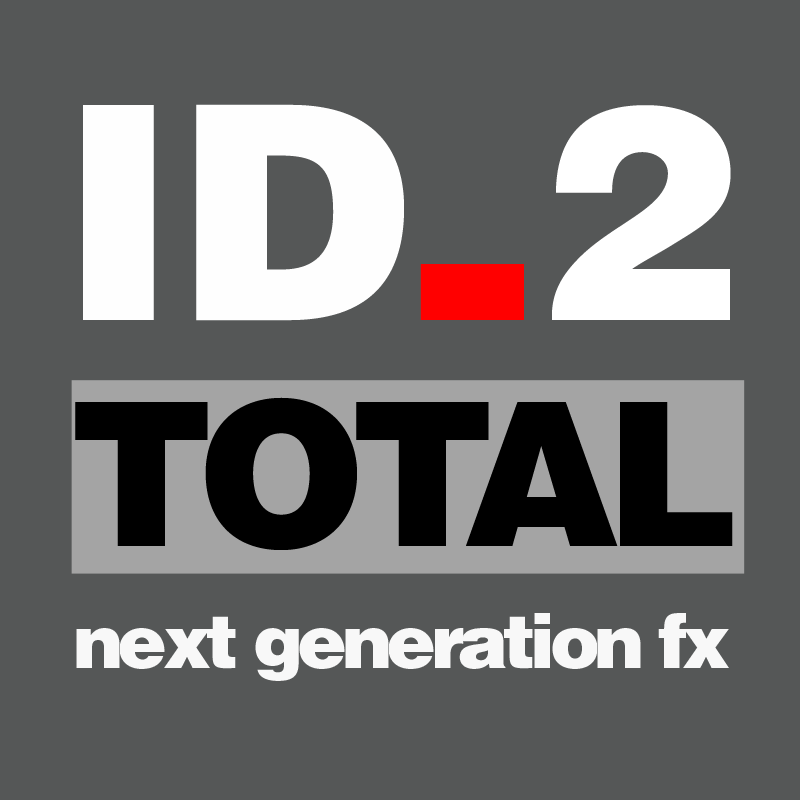 Across the Series, you get all of the FX from ID_2 TOTAL and highlights from its impacts and beats and grooves categories. ID_2's massive set of over 200 music tracks, mixouts, elements, soundscapes and sustains is only available in ID_2 TOTAL. Many impacts and transitions and beats and grooves cuts are also only available in ID_2 TOTAL; the Essentials packages gets edited highlights of these categories. Only ID_2 TOTAL gives you the opportunity to buy exclusivity so your station can own the next generation sounds in your market. This means if you get in first with the original ID_2 and request exclusivity, no one else in your station's market will be permitted to buy either the Essentials Series or the original ID_2 package. You can't buy exclusivity with the Essentials Series. The final but important difference is that ID_2 TOTAL is available to all stations, including national stations, groups and networks - and can be licensed to production companies - whilst the ID_2 Essentials Series and ID_2 Speedshots is only available to regional and local stations and to individual freelance producers. Our secure purchase and delivery system means that you get your package as fast as your internet connection can download it. As soon as you make payment you'll immediately be taken to your unique download as well as receiving an email with the download details. Don't you think that's enough questions? +44 (0)20 7249 5788, drop us an email at id2@noisefusion.com or to go the contact page where you'll find all our details.